Patron Silver is called young or "joven" tequila. A similarity may be made to a young or nouvelle wine. It is known for its light, fresh, crystal clear look and an elegant smoothness not found in other silver tequilas. Many prefer this smooth, soft and light tequila over an aged and slightly oaky flavour. 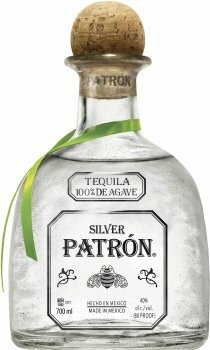 Those that know the difference may find Patron Silver the finest silver tequila available. It is perfect for blending with a high quality mixer or may be easily sipped. Patron Tequila, like the great wines and Cognacs of the world, is exceptional for a reason. It begins with the finest growing region in Mexico. High in the mountains of Jalisco exists a region which allows with perfect soil and climate which allows the sugar and acid balances of the Weber Tequilana Blue Agave to mature and produce an 'Agave Pina' unequalled elsewhere in the world. Patron tequilas are the only tequilas truly produced in the traditional handmade fashion. After harvest the 'pina' are carefully selected, trimmed and then slowly steam baked. When cooked to perfection the 'pina' is macerated with large, natural, stone-milling wheels. The fermentation is done with the fibre of the 'pina' which helps impart its unique flavour and smoothness. After a double distillation process the tequila is aged in small oak barrels. When properly aged the tequila is fine filtered and ready for careful hand bottling. Each bottle is individually signed and given a unique bottle number due to the limited number produced. Think you don't like tequila. You've probably only ever had slammers in a dirty club. Patron Silver is where you journey should have started. When sipped and enjoyed like tequila should be you'll discover the light flavours normally associated with wine and the intensity and complexity with single malt whisky. And that's not it, as a bar tender this is my first choice in tequila based mixed drinks nearly everytime. Treat yourself, your drinks shelf is short of a bottle if this is not on your shelf .